Dispense the Panna Cotta in the bottom of the verrines. Allow to completely set in the refrigerator. Next layer with the Exotic Gelee. Place a disc of the Lime Dacquoise on top of the Exotic Gelee, Pipe a layer Exotic Crème and allow it to set up in the refrigerator. 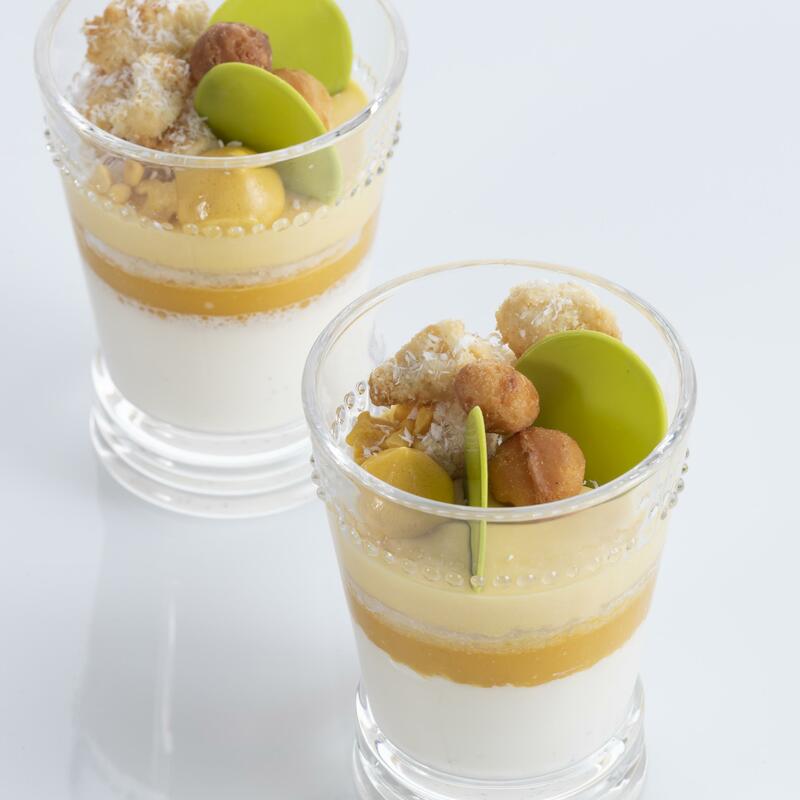 Garnish with green décor, Cantonese Macadamias and Lime Streusel. Sift together the powdered sugar and almond flour. Zest the limes directly into the dry ingredients and toss together. In a mixer fitted with a whisk, whip the egg whites and sugar to medium soft peak. Slowly fold the dry ingredients into the meringue and spread the batter onto two greased/parchment-lined half sheet pans. Bake at 350ºF/176ºC for 10-12 minutes or until done. Put the half and half in a pot and bring to a boil. Whisk in Panna Cotta (1 Box: 6 Bags) mousse mix and bring to a second boil while stirring constantly. Dispense into vessels and allow to set in the refrigerator. Bloom the gelatin in cold water and set aside. Combine the exotic purée and cream in a sauce pan and bring to a boil. In a separate bowl, whisk together the yolks and sugar, and then temper with the fruit purée mixture. Return mixture to the saucepan and cook, stirring continuously, until temperature reaches 185ºF/85ºC. Pass through a sieve. Then, strain the gelatin and whisk it into the hot cream, along with the coconut rum. Bloom the gelatin in cold water and set aside. Heat up half the tropical purée in a saucepan. Strain the gelatin and whisk it into the hot purée; add the rest of the puree and dispense on top of the panna cotta.